When restoring your cars finish color matching is key. Color matching is the process of accurately identifying the needed color for paint restorations and applications. There are, however, several barriers in the way of getting the right color. 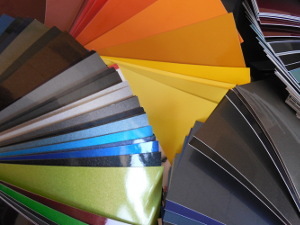 For every standard paint formula used by a manufacturer, there are as many as thirteen alternate formulas that can make finding the original color challenging to near impossible. To make things even more difficult, variations in viewing angle can further augment the appearance of the paint's color. The process may seem straightforward at first. After finding the right color, just apply the paint directly on the car and it should match perfectly. However, this is not the case. A car's coat of paint will look drastically different in the shop than it will outside in the sun. This is due in large amount to the presence of metallic flakes in the vehicle's paint that give the car a brighter appearance in full sunlight. All our paints are mixed in-house. Many times there are viariations in paint color, even in a new car. We check all our paint before painting to ensure a perfect colormatch. Our team has the patience and expertise to make the paint on your vehicle look perfect and uniform.